I'm a *huge* fan of soup and I eat it all of the time, especially during the Winter (I like to pretend the winters are cold here in sunny California). My favorite flavor of soup is actually tomato soup, and I dunk low calorie crumpets into Amy's Low Fat Tomato Soup to create a satisfying dinner a lot of the time. As much as I love tomato soup, I'm always on the look for other soups to try. 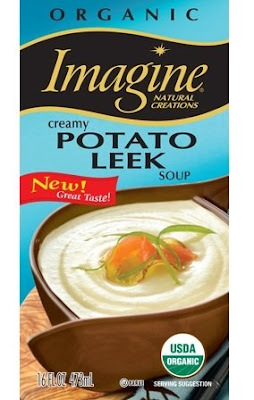 So, when I saw the Imagine Organic Potato Leek Soup on the shelf at Whole Foods, I just had to give it a try! As you might guess, I'm a huge fan of potatoes, but I try to avoid them most of the time due to the fact that they are so high in calories/carbs. So, the idea of eating a lower calorie soup that tastes like potato was really intriguing to me. And, I have to say, that is exactly what this soup delivered! After I warmed a cup of the soup, I added some low fat sour cream (a major staple for me! ), and some chives. What resulted was both smooth and creamy. In fact, it tasted just like a baked potato, but is so much healthier at 100 calories per cup, with 2.5 grams of fat, 2 grams of fiber, and 2 grams of protein (so only 2 weight watchers points). The organic ingredient list is also quite short, with the soup consisting mostly of potatoes, leeks, oil, garlic, and seasoning (so it is vegetarian, non-dairy and gluten free). If you like potatoes and leeks, I recommend trying this soup! It satisfied both my soup and potato craving! If you'd like to make your own potato leek soup, stay tuned as we've been cooking our own recipe up here as well, and I'll be posting about it in the next few weeks once it is perfected. So, what is your favorite soup? Do you make it yourself or buy it? PS. In case you are on a soup kick -- here is a link to a delicious carrot soup recipe that we make sometimes. It is really low calorie, healthy, and delicious! This looks really good! I love leek soup. My favorite soup is lentil though - but with lots of leeks, carrots, and some tomato. I make it myself. I actually don't eat soups that often even though I really like them. I love soup! A quick and easy soup I like to make is just vegetable broth and all sorts of veggies that I have lying around. It's great on cold days and is filling too. Mmm, this sounds really good, Juliet. I love potato leek soup - and really I adore all soup. Usually, I make my own, but I'm not averse to opening a can or box on occasion. Tomato soup and split pea soup are my all time faves. So yummy! I can't wait to see the recipe. I really enjoy making soup but I'm not a real big soup eater. If I have to pick a favorite, it would be my home made Vegetable "fat burning" soup. That soup looks great! I've never tried it. I love any kind of veggie soup! Delicious! Incidentally, this can also be found at Fred Meyers- at least here in Washington State. Haven't tried it yet, but I'm excited- I love leek soup!